w.w.e.d.? : let's hear it for nerve damage! let's hear it for nerve damage! i've got a raging case of carpal tunnel. haven't been able to feel my fingertips since fox started developing rolls on his back, but i can't completely blame it on my husky chief and his entourage. i'm sure my years of drawing, typing, and guitar-heroing lobbed the ball right over the plate, and fox just smacked it out of the park. i purchased this fetching wrist brace cos i didn't know what else to do. i can't do a dang thing when it's on, so i only wear it to bed, like on the third thursday of every month. i don't want to go to the doctor cos i don't want him to tell me i need surgery. anyone got any home remedies? That boy of yours is a chubby one!! Kate and I both think he's a doll though! Tell Matty his long lost pal Rob says hi! Hope besides the carpal tunnel all is well. When i read my comment, i get confused. WHen i say palms to the floor and tops of the hands to the floor, both times your fingertips should be pointing towards your body.. hopefully this makes it a little more clear. does that makes sense? poor, dovie! i'm so sorry. fetching nail lacquer though!!! Oh ouch!! I'm sorry, dove. At least you have a good mani! Go to the Dr. before it gets worse!! just kidding. much thanks for the exercises. i've been doing them all day. muchas gracias martinez! i think you should got to the dr. numbness is nothing to be messed with. 3xday for just about 1m- this will box your kidneys if you’re not careful so if you do this drink LOTS of water! second, and i don't know if this is at all possible, don't use it. or at least limit the use. 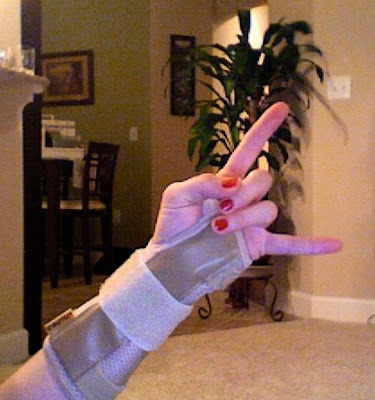 i think this along with your stylish brace should help. hope it feels better soon. no home remedies. but you are the funniest dam girl i've ever known. p.s. i spelled dam, d-a-m thinking maybe it wouldn't be a swear word if i did. no other word was fitting. Dang on the brace. Looks like a guitar hero injury to me. I think I will stick to that story. Ha ha BTW you going to get AEROSMITH on June 30th?